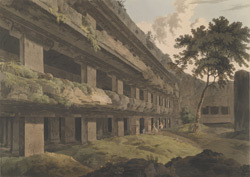 Plate 20 of 'Hindoo Excavations in the Mountain of Ellora near Aurangabad,' engraved by Thomas Daniell after the drawings of his deceased friend James Wales, which Daniell regarded as the sixth set of his 'Oriental Scenery.' Tin-Thal is a Buddhist excavation which dates probably from about the 7th Century. It consists of a broad forecourt with three superimposed halls extending deep into the cliff. The pillars are square and have simple brackets capitals. The halls were used for congregational purposes and each was provided with a sanctuary with a seated Buddha and Bodhisattva attendants.